Office 2004 for Mac is a version of Microsoft Office developed for Mac OS X. It is equivalent to Office 2003 for Windows. The software was originally written for PowerPC Macs, so Macs with Intel CPUs must run the program under Mac OS X's Rosetta emulation layer. For this reason, it is not compatible with Mac OS X 10.7 and newer. Microsoft Word is a word processor which possesses a dominant market share in the word processor market. Its proprietary DOC format is considered a de facto standard, although its successive Windows version (Word 2007) uses a new XML-based format called .DOCX, but has the capability of saving and opening the old .DOC format. 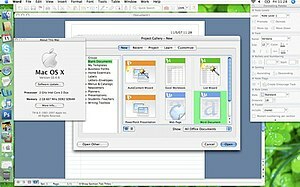 The new Office Open XML format was built into the next version of Office for Mac (Office 2008). However, it is also supported on Office 2004 with the help of a free conversion tool available from Microsoft. Microsoft Excel is a spreadsheet program. Like Microsoft Word, it possesses a dominant market share. It was originally a competitor to the dominant Lotus 1-2-3, but it eventually outsold it and became the de facto standard for spreadsheet programs. Microsoft Entourage is an email application. Its personal information management features include a calendar, address book, task list, note list, and project manager. With Entourage 2004, Microsoft began offering a Project Center, which allows the user to create and organize projects. Information may come from within Entourage or outside the program. Microsoft PowerPoint is a popular presentation program used to create slideshows composed of text, graphics, movies and other objects, which can be displayed on-screen and navigated through by the presenter or printed out on transparencies or slides. It too possesses a dominant market share. Movies, videos, sounds and music, as well as wordart and autoshapes can be added to slideshows. Included with Office 2004 for Mac Professional Edition, Microsoft Virtual PC is a hypervisor which emulates Microsoft Windows operating systems on Mac OS X which are PowerPC-based. Virtual PC does not work on Intel-based Macs and in August 2006, Microsoft announced it would not be ported to Intel-based Macintoshes, effectively discontinuing the product as PowerPC-based Macintoshes are no longer manufactured. Images inserted into any Office 2004 application by using either cut and paste or drag and drop result in a file that does not display the inserted graphic when viewed on a Windows machine. Instead, the Windows user is told "QuickTime and a TIFF (LZW) decompressor are needed to see this picture". Peter Clark of Geek Boy's Blog presented one solution in December 2004. However, this issue persists in Office 2008. There is no support for editing right to left and bidirectional languages (such as Arabic, Hebrew, Persian, etc.) in Office 2004. This issue has not been fixed in Office 2008 or 2011 either. ^ "Download Microsoft Office 2004 for Mac 11.6.6 Update". Download Center. Microsoft. December 13, 2011. Archived from the original on July 5, 2012. ^ a b "Microsoft Support Lifecycle". Support. Microsoft. Retrieved April 28, 2013. ^ Tedesco, Mike (October 12, 2009). "Office 2004 Mainstream Support Has Been Extended". Mactopia. Microsoft. Archived from the original on October 17, 2009. Retrieved October 12, 2009. ^ "MS11-072: Description of the Open XML File Format Converter for Mac 1.2.1: September 13, 2011". Support. Microsoft. September 13, 2011. ^ Clark, Peter (December 6, 2004). "QuickTime and a TIFF (LZW) decompressor are needed to see this picture". Geek Boy's Blog. Archived from the original on December 6, 2004. Retrieved October 12, 2009. ^ Heard, Chris (September 27, 2007). "It's official: no RTL support in Microsoft Office 2008 for Mac". Higgaion. Archived from the original on October 11, 2007. Retrieved October 12, 2009. ^ Morgenstern, David (August 8, 2010). "Microsoft boosts languages, proofing tools in Office 2011 for Mac, Unicode right-to-left support missing". ZDNet. CBS Interactive. Retrieved April 27, 2013. This page was last edited on 31 October 2018, at 23:06 (UTC).